I am all about my spiralizer! Of course zoodles are my number one go to dish when creating anything with my spiralizer but recently I have been all about spiralized sweet potato fries. French fries are always awesome, but when they are sweet potato fries it removes the guilt and makes them that much more delicious. So here you have it, our go to crispy baked sweet potato fries recipe that is bound to be a hit in your home just as much as it is a hit in ours! Use a knife to cut the potato spirals into smaller fries. Throw those bad boys into a bowl and coat them with olive oil. Cover two parchment-lined baking sheets and spread out the spiralized fires evenly (you may need 2 baking sheets). Remove trays and serve hot and crispy! Do you have a spiralizer? What do you make with it? such a yummy side dish! 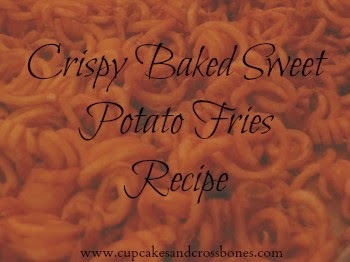 Yummm, we're all about the sweet potato fries!! Right? Sweet potatoes seem to cancel out the guilt! I have a spiralizer but I haven't used it to make fries. Great idea! you have to try it, i mean...what's better than regular sweet potato fries?? CURLY sweet potato fries! I just bought a spiralizer so Im excited to make more recipes like this one. Thanks for linking up! You will fall in love with your spiralizer. Zoodles and these fries are our favorite to make with it. Do it girl! You wont regret it! i'm not really big on sweet potatoes but I LOVE sweet potato fries. i know that makes no sense but whatever. haha it's because sweet potato fries are freakin awesome!